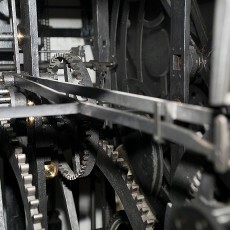 The mediaeval tower clock is located at the southern side of the Old Town Hall Tower. When the clock strikes the hour (from 9.00 a.m. to 11.00 p.m.), the procession of the Twelve Apostles sets in motion. The parade of the Apostles is visible from the Old Town Square. If you want to see them better, we recommend you to buy a ticket to the Old Town Hall, where you can admire them from the tower´s chapel. 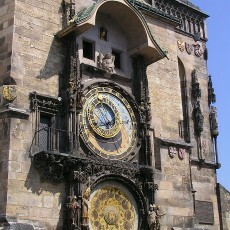 The astronomical clock was placed at the front side of the tower in 1410. At the southern part of the tower a special stone chamber was built for its mechanical part. 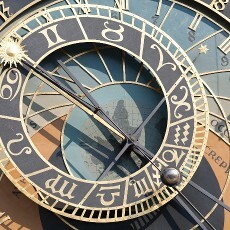 The astronomical clock consists of different parts – such as a calendar and an astronomical desk or the mechanism of twelve apostles which sets them in motion. 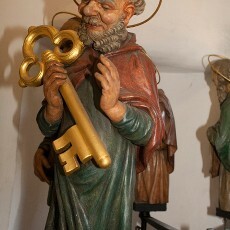 During the apostles’ parade, other figures placed on the sides of the astronomical clock set in motion too. 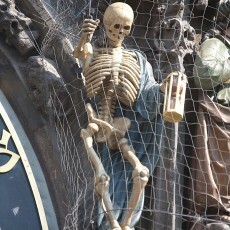 The skeleton rings, rotates an hourglass in order to show to the Turk that his lifetime is at the end. He shakes his head. The Vain Man and the Miser behave similarly. For further information see the attached articles.